A last-minute flurry of bills saved the 30th Legislature from being the least productive in history, but there were still plenty of bills that didn’t make it past the finish line. Today, we’ll be taking a look at eight good, bad and truly terrible pieces of legislation that didn’t pass this session, but we found interesting for whatever reason. And, sure, the end of the Legislature is more than a week behind us, but there’s still plenty to unpack. What do you think? Feel free to set us straight with everything we overlooked in the comments. Does not like: NRA lobbyists. Plenty of legislators called for action to limit gun violence in the wake of the Parkland high school shooting, but none introduced any additional legislation (unless you count Rep. David Eastman’s House Bill 370 that would have allowed school employees to carry guns while on the job among plenty of other loosening of the state’s gun laws). The Legislature’s only bill aimed at limiting access to guns, House Bill 75, had been introduced a year before by Rep. Geran Tarr, D-Anchorage, and it got real attention after the shooting. The legislation would essentially put in place gun violence protective orders that allow law enforcement to petition a judge to temporarily remove the firearms from the home of a person they could prove was at risk of harming themselves or others. The bill was heard a whopping eight times in the House Judiciary Committee with nearly universal support, particularly from young people and people who worked in the field of domestic violence services. The biggest apparent impact, though, wasn’t stopping mass shootings, but potentially intervening in suicides. Alaska leads the country in gun deaths per capita with a vast majority as suicides. The legislation almost seemed like it might have some momentum this session with moderate Republicans providing sensible input, but that all came to an end when the NRA got involved. What started as a clean-up bill for Alaska’s wildlife refuges turned into a low-key battle between conservationists and Sen. Cathy Giessel, R-Anchorage. The Senate Resources Committee chairwoman used the bill to add the phrase “and Hunting Preserve” to a bunch of wildlife and waterfowl refuges, including ones not in the original version of the bill. It was pitched as a way to be more inclusive of the activities that go on in the refuges, but most saw it as a thumb in the eye to the liberal greenies (including the two that run the House Resources Committee). The bill was the only concurrence vote left on the table in the House. Identifying marks: An “unfair and self-serving” amendment. Poor Sen. Peter Micciche. The Soldotna Republican has faithfully pushed year after year for an overhaul of the state’s alcohol laws built by a working group of different interests. The carefully negotiated bill is seen as one of those consensus-driven approaches (kind of like Senate Bill 91’s process) that seems to invariably get blown up toward the end of the process. This time, the culprit is the bubbling feud between the established bar and restaurant business and the upstart brewery and distillery industry. Pretty much everyone involved wanted to keep hot button issues like distillery cocktails and wholesale requirements out of the bill, but where’s the fun in that? The final straw was a last-minute amendment that would have cut the already-tight serving limits on distilleries and breweries by a third. Micciche finally pulled the plug on the 113-page bill on what was the second to last day of session, issuing one of the saltiest press releases we’ve ever seen. The real problem, however, was just how glacially slow the bill was moving through the Legislature. Senate Bill 76 was introduced in 2017 but didn’t get a hearing in the Senate Labor and Commerce Committee until mid-March of this year, and didn’t get out of the Senate until the end of April. Thanks to a last-minute floor amendment, the cocktail issue emerged from the carnage. At least Micciche finally got his statewide smoking ban. Reward if passed: About $25,000 per individual. Rep. Scott Kawasaki’s House Bill 127 wasn’t a particularly high-profile bill, especially outside the Fairbanks area, but it was the subject of at least one public rally. The legislation would allow people who were wrongly convicted and imprisoned to apply for the dividends they missed out on. The legislation would apply to anyone, but is specifically targeted at the men known as the Fairbanks Four. The men–Marvin Roberts, George Frese, Kevin Pease and Eugene Vent–were released from prison in 2015 after spending nearly two decades in prison when the state gave up defending the convictions against a growing mountain of evidence that the state may not have only got the wrong guys, but intentionally got the wrong guys, coached a key witness and ignored a bunch of credible alibis because they came from Alaska Natives. The men were released with an agreement they couldn’t sue the state, but also found themselves on the outside not even eligible for the normal re-entry services that released offenders are eligible for. It’s been a tough journey helping them get back on their feet and the bill was seen as a small effort to help them out. The bill sailed through the House in 2017 before arriving in the Senate, where it was slapped with three committee referrals and was never heard. Sen. Bill Wielechowski, as he’s wont to do, attempted to get it discharged from committee in a procedural floor vote that failed 13-4. Known to be: Very confusing the more questions the House Finance Committee asks. Another under-the-radar bill was Rep. Les Gara’s House Bill 41 that would have allowed an unlimited amount of legislators to sign on as co-prime sponsors of legislation in a wider window. The idea, he said, would be to foster greater bipartisanship in the Legislature by allowing majority and minority members to be able to call bills their own. The legislation was largely inside baseball sort of stuff, and legislators spent most of the session getting wrapped around the axle about just how the legislation would work in practice. Needs: Less outdated ideas about marijuana and the drug wars. Alaska’s voters legalized marijuana in 2014, but there’s still plenty of people paying the price for being convicted–or even just charged–for things that are no longer crimes. Rep. Harriet Drummond, D-Anchorage, sought to fix that with House Bill 316 that would take certain marijuana-related crimes off the online CourtView database, which is the first–and usually only–stop that people make when looking into someone’s criminal past. The bill had one of the better shots of any on this list having reached the Senate Finance Committee where it was actually heard once, but ultimately that wasn’t enough and that’s where the bill was left. Likely to: Cause Democrats to walk out. While the House was wasting time with a resolution to put the permanent fund dividend into the Alaska Constitution, the Senate was pushing ahead with its own feel-good legislation. Senate Bill 196 would have put in place a statutory spending limit on the Legislature that no judge would have found constitutional. Still, there was a late-in-the-game attempt to get it out of committee and to the House floor, which failed on a 22N-18Y vote. Newspaper endorsements: One, which was later taken back. Rounding out the list is Senate President Pete Kelly’s Senate Bill 193, which would have required most able-bodied adult recipients of Medicaid to work, be looking for work, be participating in a subsistence lifestyle or raising children. Pitched as some sort of compassionate attempt at teaching the poor the value of work, the bill’s hearings were filled with incredibly misinformed statements that shed light at just how little Alaska’s legislators know about what it’s like to be poor. Also, surprise, the bill was obscenely expensive and didn’t save the state anything. It never really had a chance in the House or at the hands of Gov. Bill Walker, but it does go a long way to stoking working-class resentment of the poor. So, uh, mission accomplished? Check in tomorrow, where we’ll either have the top eight winners or top eight losers from this year’s legislative session. Suggestions for who or what should make that list? You made it this far, the least I can do is hear you out. Hit me up at matt@midnightsunak.com. 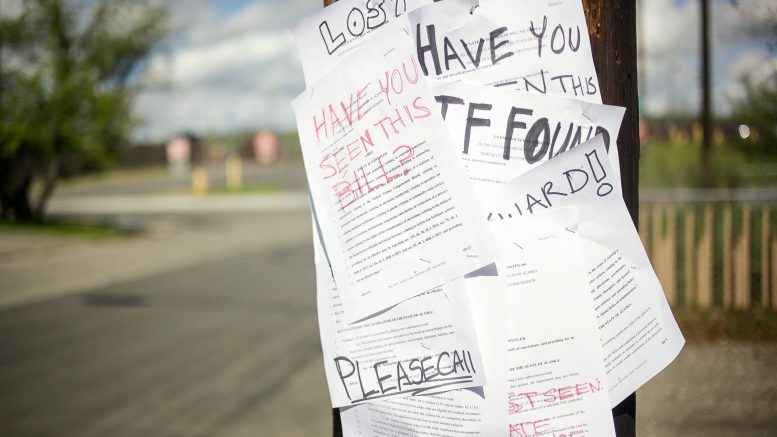 Be the first to comment on "Lost Bills: Eight good, bad and terrible bills that were left behind this session"